, a learned Italian Jesuit, was born in Alexandria de la Paglia in 17u4. He was the second son of the count of Calamandrana, descended from an ancient and noble family, originally from Nice. 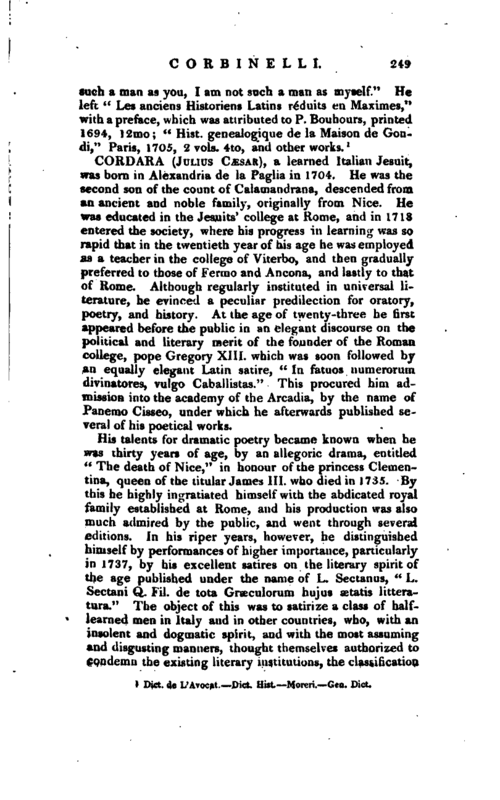 He was educated in the Jesuits’ college at Rome, and in 1718 entered the society, where his progress in learning was so rapid that in the twentieth year of his age he was employed as a teacher in the college of Viterbo, and then gradually preferred to those of Fermo and Ancona, and lastly to that of Rome. Although regularly instituted in universal literature, he evinced a peculiar predilection for oratory, poetry, and history. At the age of twenty-three he firs appeared before the public in an elegant discourse on the political and literary merit of the founder of the Roman college, pope Gregory XIII. 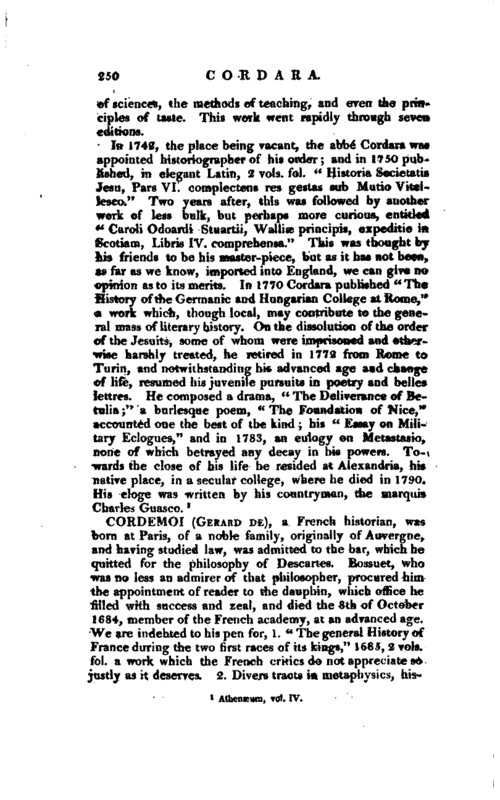 which was soon followed by an equally elegant Latin satire, “In fatuos numerorum divinatores, vulgo Caballistas.” This procured him admission into the academy of the Arcadia, by the name of Panemo Cisseo, under which he afterwards published several of his poetical works. His talents for dramatic poetry became known when he was thirty years of age, by an allegoric drama, entitled “The death of Nice,” in honour of the princess Clementina, queen of the titular James III. who died in 1735. By this he highly ingratiated himself with the abdicated royal family established at Rome, and his production was also much admired by the public, and went through several editions. In his riper years, however, he distinguished himself by performances of higher importance, particularly in 1737, by his excellent satires on the literary spirit of the age published under the name of L. Sectanus, “L. Sectani Q. Fil. de tota Graculorum hujus aetatis litteratura.” The object of this was to satirize a class of halflearned men in Italy and in other countries, who, with an insolent and dogmatic spirit, and with the most assuming and disgusting manners, thought themselves authorized to ppndenm the existing literary institutions, the classification | of sciences, the methods of teaching, and even the principles of taste. This work went rapidly through seven editions.